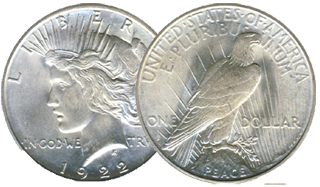 The Peace dollar coin was minted from 1921 to 1928, and again in 1934 and 1935. Its reverse depicts a Bald Eagle at rest clutching an olive branch, with the word “Peace”. It was the last United States dollar coin to be struck for circulation in silver. The Peace dollar coin was first struck on December 28, 1921; just over a million were coined bearing a 1921 date. When the Pittman Act requirements were met in 1928, the mint ceased to strike the Peace dollar coins, but more were struck in 1934 and 1935 as a result of other legislation. In 1965, the mint struck over 300,000 Peace dollar coins bearing a 1964 date, but these were never issued, and all are believed to have been melted.